Data is an important tool when planning and executing a culture enhancement effort. 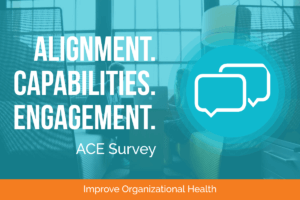 The ACE Survey is designed to improve organizational health. Integris uses the ACE Survey to help clients collect meaningful data from employees. “ACE” is an acronym for Alignment, Capabilities, and Engagement. Alignment – How connected are employees to the business strategy? Capabilities – Do employees have the competencies, resources, and information they need to deliver to customers and execute the strategy? Engagement – Are employees committed to the company, willing to go the extra mile and to be an advocate for the business? Read more about using the ACE survey.